Home cooked Chinese food played a large role in my culinary upbringing as a child, hence the inspiration for Soy Sugar Sherry. I am told that during the few years that my parents were married, they literally ate Chinese food every night, most of which was homemade. My mom actually took Chinese cooking lessons at night and when she’d return home, she and my dad would stay up all night recreating the dishes she had just learned. On weekends as a one year old they’d take me to Chinatown to (once-was) Joy Luck on Mott Street for Beef Sung and Soy Sauce Chicken. I’m told that I would eventually wilt at the table in my high chair, comatose after too much food and excitement, something my daughter has been known to do as well. Perhaps my first MSG hangover? With so much Chinese food running through my veins as a child, it shouldn’t come as a surprise that I started creating recipes of my own. There’s something incredibly satisfying about a clean, light and yet fulfilling bowl of wonton soup. There’s definitely some scary stuff out there, slippery, heavy noodles encapsulating a grey mound of mystery meat, swimming in tasteless bright yellow broth. For mine, I’ve added ginger and scallion for freshness and bite, but tried to keep the amounts subtle. The mushrooms add earthiness to the filling, and keep them very light. Using a food processor ensures that the flavors are well integrated. The beauty of this soup is that can be kept simple, as this recipe calls for, or elevated to a super filling main course with loads of veg, tofu or roast pork, even some Chinese egg noodles. It’s a fantastic base, and a technique that can easily be adapted. 1 32oz carton of chicken broth or homemade! In a food processor, add ginger, scallion and shitake mushrooms and blend until finely chopped. Then add chicken thighs and soy sauce until a paste is formed. Beat the egg and set aside. Set up a work station with wrappers, egg and filling. I find that it’s easiest to assemble the wontons on a plate and set them aside on another plate or, if you’re making a lot, a cookie sheet covered with wax paper. Turn the wrapper on an angle to look like a diamond and add a spoonful of filling. I add close to a tablespoon because I like them big. Dip your finger into the egg and smear some on the top two sides of the diamond. 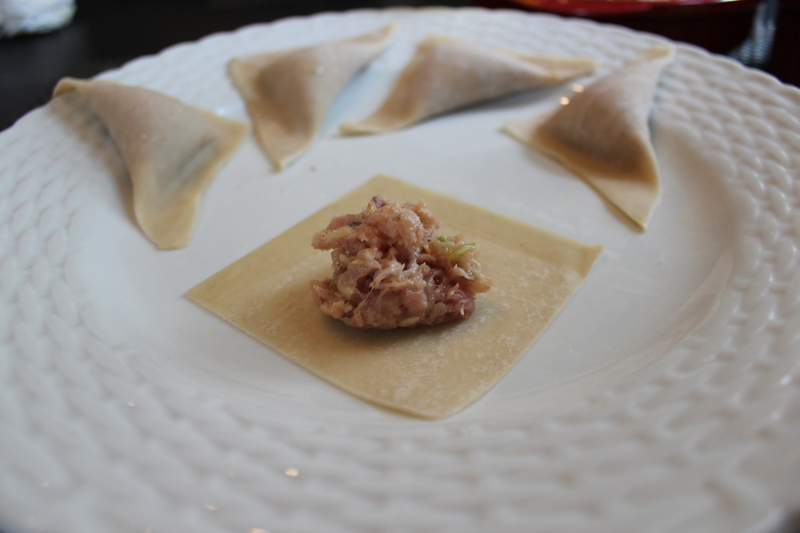 Fold the wonton wrapper in half to form a stuffed triangle and press your fingers along the two sides to seal them. Set aside until you have made enough to serve. I recommend making only as many wontons as you plan on eating at that time and assembling them right before you’re ready to cook them. Doing them well in advance may result in soggy wrappers that fall apart when cooked. Don’t worry if you don’t use all the wrappers in the package as they tend to give you a ton. If wrapped well, they’ll keep for more than a month in the fridge. Heat your chicken broth in a large soup pot. I tend to have cartons of organic chicken broth in the cupboard or some homemade broth in the freezer. Choose whichever is convenient. The broth is not the centerpiece of this dish but you do want it to be aromatic. I like to add a few very thin slices of ginger and about a teaspoon of soy sauce as it’s heating. 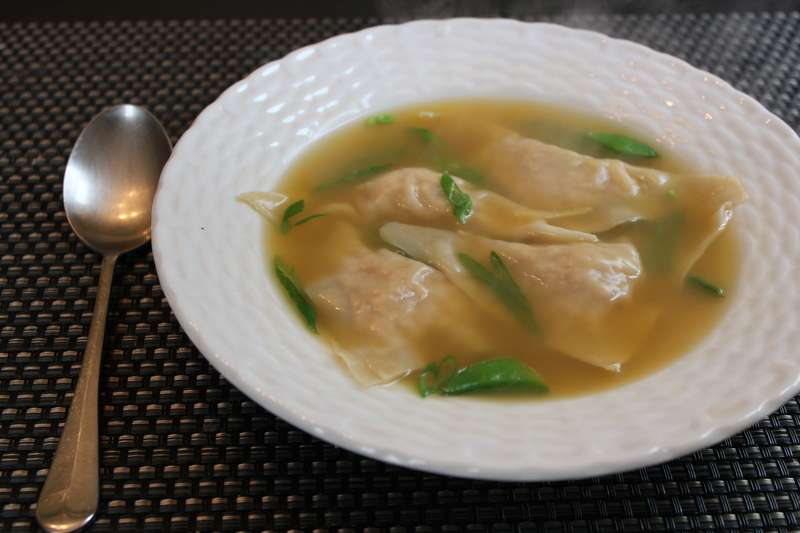 Once the broth is boiling, add the wontons. I would not recommend doing more than 15 at a time. This recipe can make as many as 25-30, in which case you may want to do two batches if you plan on making all of them. We tend to save the filling and eat it a second time for lunch the next day. While you don’t want to stir the wontons, be sure the shake the pot a bit to make sure that they’re not sticking to the bottom. They should not take more than 3 minutes to cook. After about 2 minutes, add the snow peas and scallions. 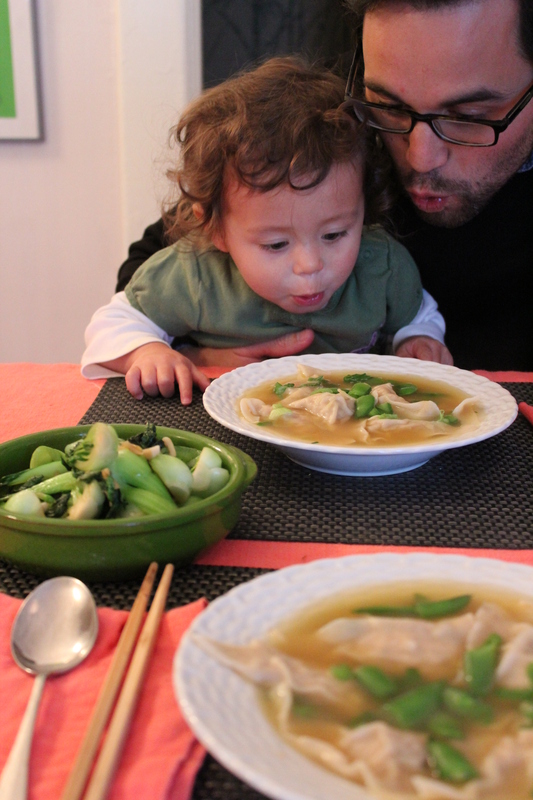 These wontons are big and we eat them as the main course with some veggies on the side. Therefore, don’t be afraid of heaping portions. This is not your lunch special appetizer!